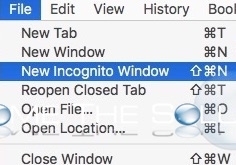 In Google Chrome, you can open new windows in Incognito mode. Incognito mode windows browse the Internet without saving your browsing history and download history. This only prevents your browser from saving history and downloads. Incognito mode does not apply to your Internet Service Provider, employer, and websites themselves. You can read more on Google Incognito mode here.